Hosni Mubarak and his driver arrive at an intersection. The driver asks his boss, "Which way, ya rayyis. (Mr. President)?" Instead of answering his question, Mubarak asks him, "Which way did Nasser turn?" The driver replies, "Always to the Left, ya rayyis." "And which way did Sadat go?" "Always to the Right, ya rayyis." "DON'T MOVE!" shouts Mubarak. That famous joke from Mubarak's long, ultimately aborted rule, in which he tries through timidity to escape the fate of his two bold predecessors – Gamal Abdel-Nasser, who died a humiliated, if still-idolised, failure in 1970, and Anwar Sadat, murdered in 1981 on the anniversary of his great military victory of 1973 – illustrates very well the remarkable difference (so far) between the nation's controversial but wildly popular new president, former defence minister Abdel-Fattah al-Sisi, and all three of these men, to whom al-Sisi is often compared. 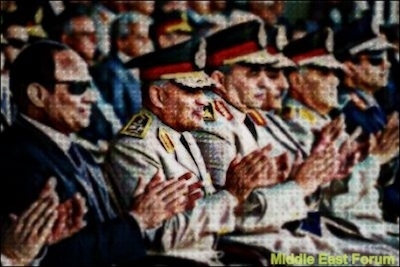 The overwhelming election of the strong-willed but mysterious field marshal in May as Egypt's sixth president marks a truly historic moment, in a land where history itself is almost a cliché. The ancient nation on the Nile and its charismatic new leader, inaugurated on June 8, confront a number of both old and new challenges and opportunities as well. The toughest challenge – and the most challenging opportunity – facing al-Sisi is to establish security after three years of mostly uncreative chaos, as the Middle East explodes in bloodshed, from Iraq to Syria, and from Israel to Gaza. Moreover, he must do this while completing a successful transition to something more than just resembling democracy, with a much greater space for civil society and individual liberty, despite his own widespread cult of the personality – a first for the country after five millennia of mostly highly-centralised, pharaonic-style rule. Only then can he hope to accomplish the comparatively mundane but essential task of restoring the barely-recovering post-revolution 2.0 economy, fuelled with a quick infusion of $12 billion in cash from Saudi Arabia and the United Arab Emirates after al-Sisi overthrew their enemy, former President Mohamed Morsi, the hardline leader of the Muslim Brotherhood (MB), a year ago, following the largest demonstrations in human history. Al-Sisi hopes to accomplish this by coaxing back foreign investors and tourists frightened off by three years of chaos following three decades of mostly relative calm – with the exception of an Islamist terrorist insurgency that claimed a thousand lives in the 1990s – under Mubarak. The economy will remain stuck in low gear or even go back into reverse if the slowly-escalating civil war does not end – with al-Sisi's victory – soon. How Egypt – the largest Arab country, America's second most important ally in the Middle East after Israel, and a major player in Africa as well that sits astride the Suez Canal – under al-Sisi deals with this situation is crucial not only for its own growth and stability, but also for that of the region and the world beyond. A quiet, little-known staff officer who had served as head of military intelligence under Mubarak, al-Sisi was appointed minister of defence in August 2012 by President Mohamed Morsi, who became Egypt's first elected president (in a close and non-transparent vote) that June. Morsi, also Egypt's first Islamist president, who is thought to have favoured al-Sisi for his piety and apparent affinity for the MB, alienated the majority of Egyptians by declaring himself above the Constitution, working with fellow Muslim extremists, at home and abroad, while rapidly seeking to establish a thoroughly dictatorial one-party state. 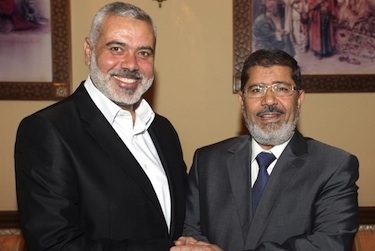 Egyptian president Mohammed Morsi, right, meets Hamas leader Ismail Haniyeh in Cairo, July 2012. Morsi raised convicted terrorists to high positions and showered others with honours, covertly cooperated with them in their war against Israel and the Egyptian Army in Sinai, called for the release of two major al-Qaida (AQ)-connected terrorists in US custody (a cause on which he worked with Muhammad al-Zawahiri, brother of AQ's leader Ayman al-Zawahiri), freed convicted Islamist killers at home, seemed willing to give up disputed lands near the Sudanese border to the Islamist government in Khartoum and to be about to declare jihad against the Assad regime in Damascus. All these offended al-Sisi's traditional sense of Egyptian nationalism, which obviously outweighed his reputed Islamism. When on June 30, 2013, more than 30 million demonstrators peacefully took to the streets to demand Morsi's removal, al-Sisi issued an ultimatum for both sides to meet and resolve their differences within 48 hours. Morsi refused to talk with the Opposition, and on July 3, al-Sisi, evidently placing loyalty to nation over the man who promoted him, took action. Arresting the president and his entourage, he appointed a transitional government of technocrats headed by the head of the Supreme Constitutional Court, Adly Mansour, as mandated by the Constitution, all as laid out in al-Sisi's roadmap to a return to democracy. The public euphoria at being rid of Morsi was soon marred by an anti-Christian pogrom launched by the MB and their Salafi allies (who wrongly blamed that community for their downfall) and a bloody campaign of bombings and shootings against both security forces and civilians that to date has claimed nearly 2,000 lives. In response to this violence, the interim government and the largely independent judiciary officially labelled the MB as a terrorist organisation and even banned its Palestinian branch, Hamas, for taking part in it. The resulting crackdown on supposedly 'peaceful' MB demonstrations (which have often been riddled with armed sympathisers acting as agents provocateure), and an intensified war with Islamist terrorist groups along the sensitive Israel border in Sinai that began in Mubarak's waning years, have drawn howls of protest against al-Sisi's alleged indifference to human rights and crushing of dissent. The critics have included US President Barack Obama, who has promoted supposedly 'moderate' Islamists such as the MB, reaching out to them as early as his 2009 'address to the Islamic world' from Cairo. Yet despite deceptively liberal rhetoric, they are in fact part of the global jihad – at the expense of secular liberals in the Arab Spring. Many senior Republicans as well as Democrats in Congress are also still furious over the removal of the MB and the subsequent crackdown, leading to an almost complete freeze in the annual $1.3-$1.6 billion in mostly military aid to Egypt post-Morsi. This has infuriated millions of Egyptians, who bitterly recall Obama's heedless increase in aid to Morsi's regime when it reached the height of its tyranny. They are equally angry that Obama and key Republican Senators John McCain and Lindsey Graham have demanded that Morsi and the MB be allowed back into government, even as it wages a terrorist war against the state and society. Nor is there any guarantee the Islamists would accept to share power, or not seek revenge should they see a chance to exact it. Since Morsi's overthrow, there have indeed been abuses, including the alleged 'disappearing' of opposition members, the banning of unauthorised demonstrations; the charging of professors and liberal activists with improbable offenses; the handing out of mass death sentences for more than a thousand persons after perfunctory trials for murder and pillage (automatically voided when the condemned are apprehended); failing to stand for the national anthem and the burning of the nation's flag have been outlawed; and the TV programme of 'Egypt's Jon Stewart,' political satirist Bassem Youssef, has been cancelled due to anonymous threats against his person. "When the new parliament is voted into office later this year, [al-Sisi] should press for new, less draconian laws that better protect freedom of speech and assembly, which allow anyone to demonstrate peacefully, but which still deal decisively with those who commit violence against the state and society." The greatest uproar so far has been over long prison sentences handed out to three journalists from Al-Jazeera, the Qatar-based TV network that tends to support the MB, for allegedly materially aiding the Muslim Brotherhood, now officially listed as a terrorist organisation, based on dubious evidence. While al-Sisi initially refused to comment, he said, out of respect for the independence of the judiciary, he told the Egyptian newspaper Almasry Alyoum on July 7, "I wish they were deported after their arrest, instead of being put on trial," raising speculation that he would pardon them if they fail to win release on appeal. This really is his greatest opportunity to silence his critics—not by jailing them, but by pardoning activists and journalists whom the courts have clearly treated unfairly. And, when the new parliament is voted into office later this year, he should press for new, less draconian laws that better protect freedom of speech and assembly, which allow anyone to demonstrate peacefully, but which still deal decisively with those who commit violence against the state and society. Meanwhile, the stunning advance this summer of the Islamic State in Iraq and Syria (ISIS) is no doubt thrilling to the Jihadis fighting against Egypt under al-Sisi. The very example of their rapid, unexpected success could fire up terrorist recruiting – as well as fighting – all over the region, further destabilising regimes already struggling to regain their balance after the upheavals of the Arab Spring. Indeed, in late July, what were first described as smugglers, but are now thought to be Islamists, ambushed an Egyptian outpost on the Libyan border, killing 21 – shortly after Cairo warned of a dangerous build-up of terrorist forces in that area. The government fears that these groups seek to link up with others in Sinai and around the country to form a common insurgency, leading to an Islamic State in Egypt. Complicating al-Sisi's struggle against the Islamists is the current fighting in Gaza, in which Hamas – former darling of the Egyptian masses who had cheered its suicide bombings against the Jews for decades, now outlawed and widely reviled for its role in the civil war to restore its parent organisation, the MB, the power – is pitted once again against the much-demonised Israel. Adding further complexity is that Egypt's traditional role as mediator between the various Palestinian factions and Israel is undercut by the hostility between Hamas and al-Sisi, whereas the last great Hamas missile offensive against Israel, in November 2012, was ended through the mediation of its close ally, Morsi. The current conflict started with the kidnapping/murder of three Israeli teenagers (a Palestinian teen was subsequently kidnapped and killed, for which Israel arrested three Jewish suspects) by Hamas activists, followed by a campaign of indiscriminate rocket fire over 80 percent of Israel proper, and commando attacks via tunnels inside Israel. Though Egyptian officials (and the local media) use the ritual rhetoric about "Israeli aggression" for public consumption, this time, the passion is lacking–especially after 170,000 deaths in the last three years in Syria, and many thousands more in Iraq and the region as a whole. In reality, al-Sisi – who had already stepped up security cooperation with the Jewish state to a level exceeding that which had existed even under Mubarak – along with many Egyptians, is discreetly content, at least to some degree, to see Israel thrash their common enemy. In Cairo's calculation, Iranian-funded (and armed) Hamas – which is now also competing and perhaps even collaborating with IS, whose black flags had lately been flown at funerals in Gaza – is as great a threat to itself as to Israel. In reality, it is all the same war. Yet the inevitable civilian deaths resulting from Hamas' use of its population as human shields, by placing its weapons and command and control centres in and under schools, hospitals and apartment buildings, could make al-Sisi's stance against Hamas, and even his insistence that Egypt continue to honour the peace treaty, more difficult to sustain if the fighting goes on much longer. This is despite the extraordinary measures – including advance warning by leaflets, phone calls and texts messages, and the initial use of dummy bombs to give civilians a chance to escape – taken by Israel to limit these deaths as much as possible. Early on, al-Sisi proposed a ceasefire, quickly accepted by Israel and endorsed by the Palestinian Authority and the Arab League – but repeatedly rejected by Hamas, primarily because it would not lift the blockade against Gaza maintained by both Israel and Egypt for reasons of terrorism prevention since 2007, and which neither can afford to end now. But for Hamas, which knows that the blockade will remain in place so long as it or its Islamist allies continue to control Gaza (where it rules with an iron fist that a recent poll shows has made it unpopular with seventy percent of the people), the real issue is not what the proposal says, but that it came from al-Sisi. Instead, Hamas insists that his enemies and its own key regional benefactors, Qatar and Turkey, be given the lead in any negotiations, backed by the Obama administration – which, after all, had supported the MB in Egypt and is full of Hamas sympathisers to boot. That is why Cairo twice refused to host US Secretary of State John Kerry, who had wanted to insert Qatar and Turkey, each of which has damaged relations with Egypt through their attempts to restore Morsi – into the crisis. For their part, in order to drive Egypt out of the game, both Doha and Ankara are cynically urging Hamas to stick to its guns over the blockade before agreeing to a lasting halt to the fighting. Despite intensive efforts behind the scenes, they failed to cut out al-Sisi. After three days in Cairo, Kerry, along with UN Secretary-General Ban Ki-moon, called for a week-long pause in hostilities to deal with humanitarian needs and to allow space for more serious talks among all the powers to follow. On July 25, the Israeli Security Cabinet voted unanimously to reject that proposal, as it would have completely lifted the blockade, allowing Hamas to freely re-arm and rebuild its military infrastructure. Yet it would not have allowed the IDF to continue its search for tunnels, of which it had found an increasing number in recent days. Worse, it seemed to put democratic Israel on the same footing as Hamas, listed as a terrorist organisation by the US, the European Union, Canada, Japan and others. Israeli officials were appalled by what they saw as outright betrayal by chief diplomat of their most important ally – which at the same time, 'tunnelled under the Egyptian initiative,' as one of them put it. And Kerry didn't let up after unleashing his dreadful proposal. Following Friday's fiasco, he jetted off to Paris and, quite extraordinarily, convened further consultations dominated by countries that overtly wish to do Israel harm. He met with his counterparts from Turkey, whose Hamas-backing leadership has lately accused Israel of attempting genocide in Gaza and compared (Israeli Prime Minister Benjamin) Netanyahu to Hitler, and with Qatar, Hamas's funder in chief, directly accused by president Shimon Peres last week of financing Hamas's rockets and tunnels. Staggeringly, he did not bring Israel, Egypt, or the PA to his Paris sessions. Later that day, a 12-hour humanitarian pause was in place, without a halt in the search for more tunnels—the first of a series of several temporary truces agreed by both parties, each of them promptly broken by Hamas. At the UN Security Council, Jordan introduced a resolution calling for an end to hostilities and the withdrawal of all Israeli troops from Gaza – which predictably went nowhere. Several days later, the killing of 21 Palestinians, mainly children, in a UN-run school, initially blamed on Israeli artillery fire, but which may have been caused by a Hamas rocket, led to sharp rebukes from White House officials and a call from Obama for Israel to immediately stop its offensive. Following the immediate collapse just ninety minutes into a 72 hour truce on August 1, when Hamas launched an attack on Israeli troops from a tunnel, killing three (including a soldier originally thought to have been kidnapped), Obama placed the blame squarely on Hamas. Yet a series of key Democratic Party figures, from House Minority Leader Nancy Pelosi to ex-Secretary of State Hillary Clinton and others, have been speaking warmly of Hamas or else rationalising its actions, amid much talk that if this recognised terrorist group should cease to rule Gaza, it would be replaced by something far worse, like ISIS–suggesting talking points that probably came from the White House. More than likely, Obama's backing of the MB in the region is based on a similar rationale. At the time of writing, Kerry and Ban Ki-moon did manage to broker a deal between Egypt, Hamas and the PA to start discussions in Cairo toward amore permanent ceasefire. The Palestinian delegation would arrive without Hamas, which would join some time later. Israel chose not to send anyone, having lost faith that Hamas would keep its word in any agreement. Netanyahu then reportedly advised Obama, via the US ambassador in Tel Aviv, not to 'second-guess' him on Hamas again. Meanwhile, al-Sisi declined a belated invitation to an unprecedented summit of 50 African leaders in Washington on August 4-6, perhaps due to diplomatic duties over Gaza–or perhaps out of pique with Obama. More likely, it was both. Though it will clearly take time, should al-Sisi succeed, without fatal concessions, in preserving Egypt's lead role as a mediator between Hamas and Israel – whose existence Hamas has pledged never to recognize – that will strengthen his hand, both at home and abroad. If he fails, it could seriously bolster the fanatics' cause. And should the US be seen as behind that failure, it could be the final blow to the thirty-five year alliance with Washington, which has teetered on the brink since the move against Morsi. Angry over America's continued cut-off of most its annual package of $1.6 billion in mostly military aid; al-Sisi has already concluded an unprecedented $2 billion arms deal with Russia. Egypt is also now in a previously-unthinkable informal alliance with Israel, Saudi Arabia, and the United Arab Emirates: not only against the MB and Hamas, but also against Iran. These traditionally staunch American allies are all now alarmed at the Obama administration's seeming desperation to reach a rapprochement with their common enemy in Tehran–which also funds and arms Hamas and possibly the MB and its allies in the anti-al-Sisi insurgency. Should its relationship with Egypt collapse completely, the US could lose its favoured access to the Suez Canal, vital security cooperation against terrorism, and the peace between Egypt and Israel that has prevailed for so long. In these ever-evolving sandstorms of war and change, should Hamas eventually win the PR battle against Israel and his regime, will al-Sisi survive? Or will he be able to sustain the wave of anti-Islamist sentiment that has led him from the barracks to the presidential palace, and put Hamas and its fellow radicals on the path to ultimate defeat? It is, in fact, the Islamists' strategy to try to gradually destroy al-Sisi's legitimacy by driving him into a pattern of worse and worse repression, while striking again and again with bloody mayhem against the economy. This also mirrors their strategy of driving Israel into wars that it cannot afford not to wage militarily, yet, they hope, are harder and harder to win politically. So far the on-going campaign of public bombings, shootings and attempted assassinations has only driven the majority of Egyptians further behind al-Sisi. Yet he would be wise (as well as humane) to avoid the trap of striking out too blindly, as the military regime has been doing so disastrously since 1952. His remarks about the Al-Jazeera case may indicate he is aware of the need to break that pattern at last. Al-Sisi is also aware of an equally critical element in this strategy – to challenge the Islamists' narrative in order to undermine their claim to religious legitimacy.On June 30, the first anniversary of the immense demonstrations against Morsi, he declared that 'Egypt had saved Islam from extremism,' and repeated a call to 'correct the religious discourse' in order to wrest Islam, and the nation, away from the terrorists. Does this mean he would correct the anti-Christian, anti-Semitic, anti-Western, anti-female and anti-gay elements that are too often a part of it? Only time will tell. For the moment, we should encourage him in that struggle, and recognise that his war against the Islamists – who aim to impose their brutal ideology not only upon Egypt, but upon the world – is just as much our own as well. This is actually our challenge – and our opportunity – as much as al-Sisi's. If we do not help him, and should he fail because we – like the hapless Mubarak – simply refuse to move, then the next time the joke will be on us all. Dr. Raymond Stock, a Shillman-Ginsburg Writing Fellow at the Middle East Forum and a former Assistant Professor of Arabic and Middle East Studies at Drew University, spent 20 years in Egypt, and was deported by the Mubarak regime in 2010. He is writing a biography of 1988 Egyptian Nobel laureate in literature Naguib Mahfouz (1911-2006) for Farrar, Straus & Giroux, and is a prolific translator of his works, most recently Before the Throne (Anchor Books/Random House, July 2012).